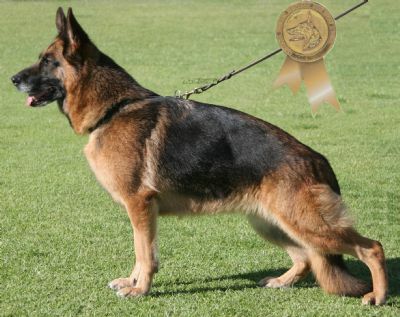 Vonpeta Kennels proudly announce that GRAND CHAMPION VONPETA TAYKALL BY STORM A Z CLASS I Multi Excellent Graded, Multi Best in Show Specialty & Multi Best in Show All Breeds has won the GOLD MEDAL at the 2008 German Shepherd National Show & Restricted Trial. Top 10 2007 GSDC of Australia National Show 9th Place Excellent Graded . 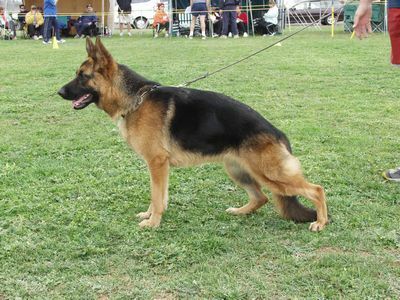 Australian Champion titled at 16 months. Grand Champion titled at 5 ½ years on the 7 of the 7 of 07! Qualifier for the 2004, 2005, 2006, 2007 and 2008 South Australian Battle of the Champions. Best in Group winner Royal Adelaide show in 2004 and 2007. GSDC of SA Inc State Siegerin 2005. Top 10 2007 GSDC of Australia National Show 9th Place. 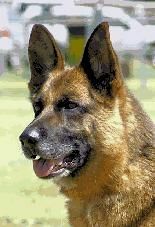 2007 South Australian PEDIGREE Show Dog of the Year. She has had one litter of puppies that were born on New Years Eve 2006 and will be mated in 2008. Storm has been brilliantly handled by Stephen Crozier in the Specialty ring and Ashley Wittenberg in the All Breeds ring. Steve was "over the moon" to handle her to the Gold Medal! We are most proud that our girl can “do it in both rings” !